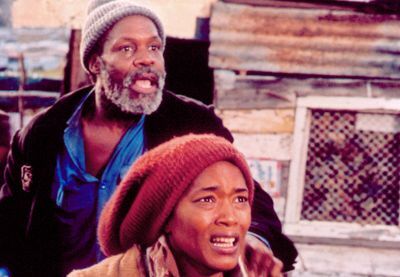 Danny Glover and Angela Bassett in Boesman & Lena. "You feel through the frustration of these two characters an enormous appetite for life," explained a producer of Boesman & Lena during a post-screening discussion at the New York Film Festival. This minor but affecting new movie about a homeless South African couple who, for one long night, purges the entire history of their troubled marriage is exhilarating, exhausting, and just a little bit scary. We almost expect them to devour each other, so relentless is their verbal sparring. If the movie has a flaw, it is that their rapid fire bickering feels directionless and leaves us with few lasting impressions. What remains with us, however, is the intensity. This is largely due to the performances of Danny Glover and Angela Bassett, two of Hollywood’s most under-utilized talents. Together, they set off sparks. Both belong to that rare breed of actor, the kind possessing an intellectual ferocity to match the physical one. And their intensity is matched in every scene by the storytelling talent of the late director John Berry, who died shortly after the film’s post-production. Berry scripted the movie from the stage play by South African writer Athol Fugard, and has deliberately retained the play’s isolated, claustrophobic feel. The deserted Cape Town beach where much of the story unfolds is devoid of life and seemingly cutoff from civilization, like an existential afterworld. Glover and Bassett, tentative at first, come to dominate it like feuding monarchs hell-bent on destroying each other. Undeniably dialogue-driven, Boesman & Lena benefits from the director’s terse but expressive visual style. We shuttle from present to past in what Berry called "flashes": memories perceived at the moment, lasting only a few seconds. A reference to Lena’s still-born baby triggers a fleeting image of a tiny coffin being lowered in the ground; the mention of Lena’s first encounter with Boesman evokes a colorful village dance filled with swaying skirts and bare feet. Berry’s method of editing two chronologically unconnected scenes is a pure revelation. When Lena’s finger, tracing the outline of a mountain top, becomes the finger of Lena in the present, tracing the outline of a different mountain, her entire life passes us in one dense, elliptical rush. If Boesman & Lena has a central image, it is of a solitary tree, its gnarled, leafless branches endlessly entwining and strangling each other. Its deformed presence, like Boesman and Lena’s marriage, thrives in spite of itself. The hostile beach seems to give it life. For Boesman and Lena, the beach is equally home and foreign land. It’s a place they’ve returned to so often that Lena has trouble remembering which route they took. "How did we get here?" she asks, and names off the cities on their migratory path. Their displaced lives find strange comfort amid the beach’s wild thickets. They slowly turn it into a makeshift home, and near the end, Lena takes off her knit cap to reveal her own wild hair. Like its images, the movie’s philosophical contour is both austere and expansive. Potentially lofty subjects such as independence, poverty, even spousal abuse have an earthy quality. When Boesman finds a piece of scrap metal, he tells Lena that the scrap represents his freedom. Later he discards it on the roadside in a highly symbolic act, though we suspect he simply has too much stuff to carry. Like Boesman’s load, the movie’s ideas are burdensome and numerous. Fugard’s thin story over-extends itself in scope and depth. But Glover and Bassett lend so much acting muscle that not only do they make the movie succeed but they also remind us of Peter O’Toole and Katharine Hepburn doing pretty much the same thing over thirty years ago in The Lion in Winter. Bassett, all teeth and sinew, nearly steals the movie from her softer-spoken co-star. She gives the performance of her career as a woman who, like her character in Strange Days, has yet to reconcile her independence with her attraction to a no-good man. After being struck by Boesman, she wonders aloud, "Why did you hit me? Maybe because you just want to touch me." Who else but Bassett could so convincingly vocalize such a deeply internal thought? To the credit of everyone involved, Boesman & Lena makes no overt political statement. The word "apartheid" is never mentioned. Aside from the brief opening shot of white construction workers bulldozing a black township, this story could have taken place in any part of the world where blacks are a political minority. This isn’t to suggest that Berry and company are ignoring the play’s context. In fact they are quite attuned to the ethnic subtleties of modern South Africa. Boesman and Lena are an interracial couple even though both are black. Though their exact ethnicities remain cloudy, Lena frequently calls Boesman a "bushman" (and in particularly vicious moments "dark meat") in reference to his tribal background. The arrival of a third character, a black man (Willie Jonah) who speaks no English, only complicates their precarious dynamic. Berry and Fugard have created an ambiguous microcosm of black South Africa. It’s never clear who represents what and that’s why Boesman & Lena works well as political commentary and searing human drama.